Great position! Mountain Lodge is poised on top of a mountain giving you a spectacular view of the bushveld below – truly "a room with a view"
with spellbinding views, this bold and stylish lodge makes for a dramatic mountain retreat that will truly have you feeling on top of the world! Phinda Private Game Reserve is an enchanting and colourful reserve nestled in northern Zululand and, uniquely amongst South African reserves, boasts seven entirely distinct habitats over the course of its 23 000 hectares - including rare sand forest, savannah, bushveld, open woodland, verdant wetlands and stunning river courses. Prior to the reserve’s opening in 1991 this was degraded and overgrazed farmland and the transformation that followed the re-introduction of a wealth of animals that used to naturally occur here in previous centuries has been nothing short of stunning! In fact, Phinda is Zulu for "return," in reference to this triumphant restoration. The reserve now showcases not only the Big Five but many rarer and less easily spotted species, such as the scarce black rhino or elusive cheetah – in fact, Phinda boasts probably the world's most successful cheetah reintroduction programme and now offers incomparable sightings of these fleet-footed felines. What’s more, Phinda lies within a figurative sea mist's reach of the Indian Ocean, offering you the opportunity of viewing rhinos and whale sharks all in one holiday! 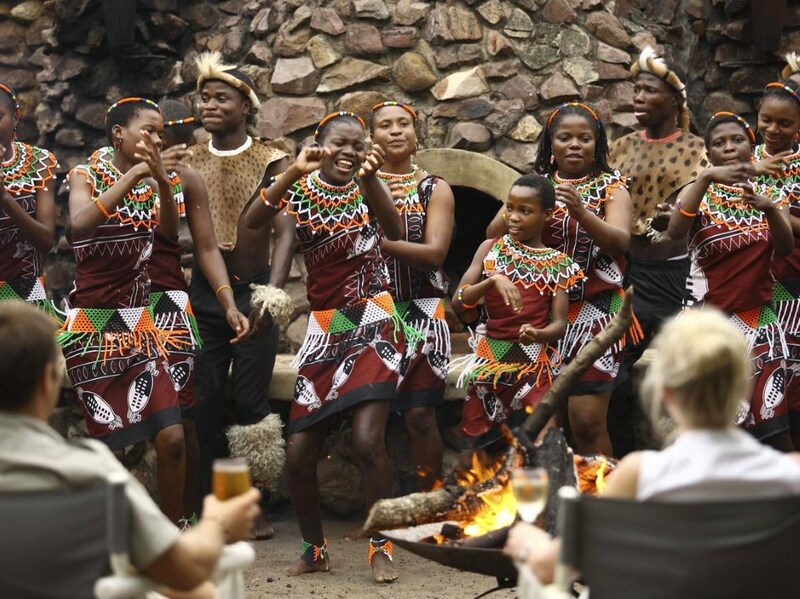 Phinda has several award-winning luxury lodges and Mountain Lodge was the original lodge built when the reserve has first opened. 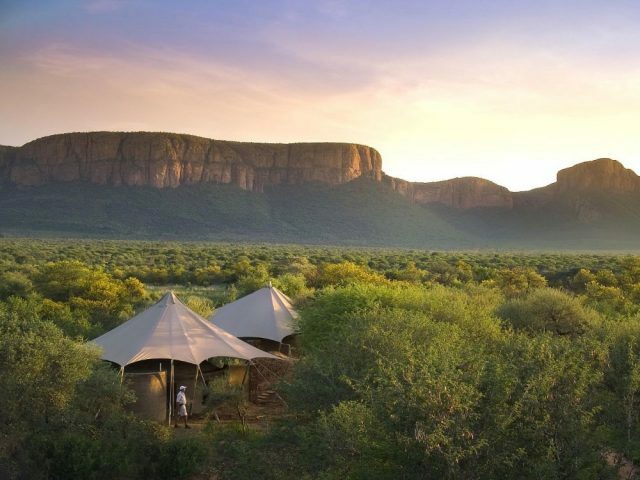 Poised majestically on the crest of a rocky mountain, the lodge commands dramatic vistas over the surrounding landscape including the impressive Ubombo Mountains. With spellbinding views, this bold and stylish lodge makes for a dramatic mountain retreat that will truly have you feeling on top of the world! 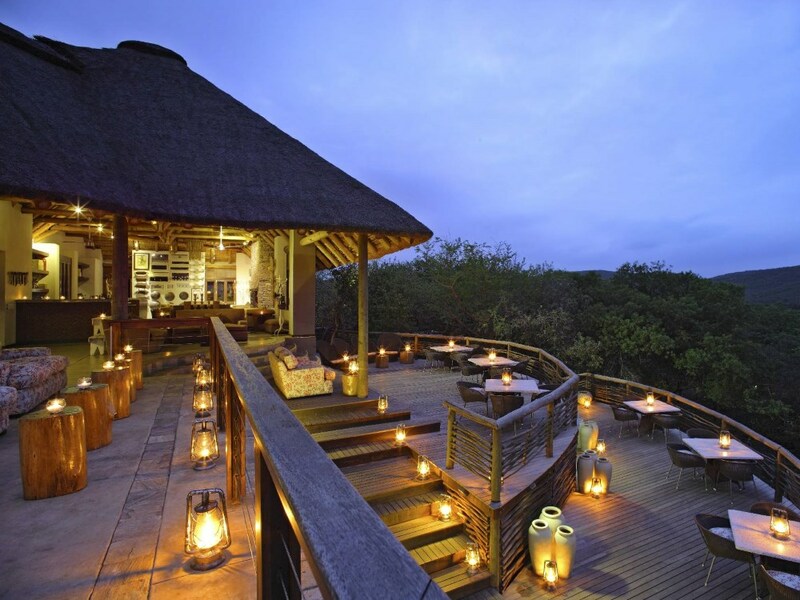 Paved pathways wind down the hillside from the lodge to the 25 elegant split-level suites with mosquito nets, thatch roofs, and large decks overlooking the reserve. There are 25 thatched air-conditioned suites - including two dedicated family suites each with foldout sleeper sofas. The suites all include a separate sitting area and en-suite bathroom with an indoor shower and stand-alone tub, all with a fantastic view – even the toilet! 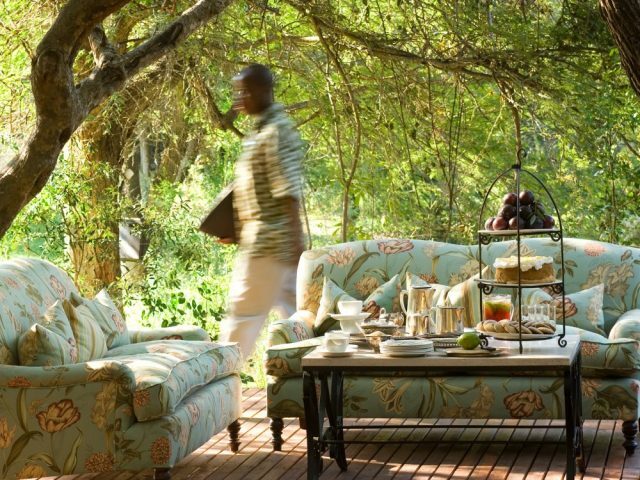 African baskets, beadwork, and grass matting beautifully complement the bush atmosphere. Careful planning means that no structures in the lodge overlook each other and your suite is positioned to ensure complete privacy while optimising the view from your own magnificent private deck. This deck is kitted out with an outdoor shower and plunge pool allowing you to savour the views and the fresh mountain air in blissful privacy - just don’t forget to take your camera and binoculars so that you can enjoy watching the warthogs drinking whilst being pestered by the monkeys! 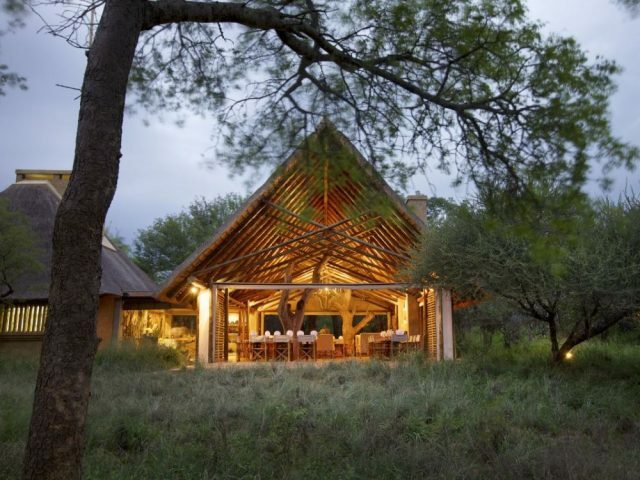 The main lodge consists of a magnificent u-shaped building with a central open air courtyard - providing seductive comfort between those exciting game drives. There is a bar and lounge with a fireplace in the lobby for those chilly winter evenings and the pool has spectacular views of the valley - where you can take a dip and perhaps keep an eye on a couple of white rhino below. Mealtimes may mean a delicious outdoor feast on the tiered deck, a luscious spread in the covered dining room or an unexpected treat in a surprise location – but don’t worry, a brisk walk along the maze of paved pathways back to the comfort of your suite will burn off any extra calories! Carefully trained rangers and Zulu trackers will transport you on open 4x4 vehicles for your two daily game drives in search of a glimpse of many different species, including the gracious nyala which is a frequent sight on this reserve with its dark brown coat, yellow legs, shaggy mane and bushy tail. You will get to observe the fascinating African elephant, as herds of these majestic and gentle giants meander through the forests - or perhaps listen to the rhythmic purr of an elegant cheetah mother as she bonds with her cubs or teaches them how to sharpen their hunting skills. Or how about tracking the endangered black rhino – definitely something to be added to that bucket list! Phinda is renowned for having some of the most highly trained, professional, passionate and knowledgeable rangers and trackers on the continent - many of whom belong to the surrounding communities and can give you an insight into their culture along with providing you with great game viewing. Alternatively, why not venture down the Mzinene river by riverboat or canoe and take in the riverine vegetation and the local bird life - if you’re lucky, you might get to see the animals come down to drink. Phinda also has a range of thrilling specialist safaris that will bring out the explorer in you and your family such as world-class scuba diving, swimming with a whale shark, an insight into Zulu culture, crafts, history and tradition or interpretive bush walks that provide exceptional encounters as wildlife gets closer than you ever dared imagine! For the more chilled out guests, why not just bask in the solitude of your suite’s personal sitting room or delight in the spacious areas of the lodge and sip on a chilled glass of wine while taking in the views from below!